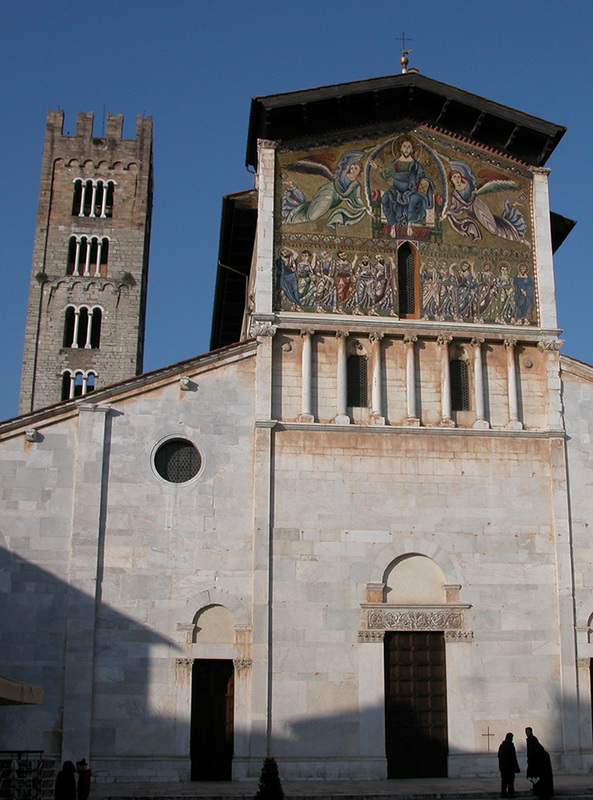 Lucca, the 'city of one hundred churches' is one of the main cities of Italy, famous even beyond national borders mainly for its intact city walls of the XV-XVII century. The historical city center of the city remained almost intact in its original appearance. Inside, the basilica is built in richly carved white marble. It consists of a nave and two aisles with arches supported by columns with Roman and Romanesque capitals. The Roman capitals were recycled from the nearby Roman amphitheatre. The highlight at the entrance is the huge 12th-century Romanesque baptismal font (the Fonte Lustrale). It is composed of a bowl, covered with a tempietto, resting on pillars, inside a circular basin. It is the craftmanship of master Roberto (his signature is on the basin) and two unknown masters. The basin is decorated with The Story of Moses by a Lombard sculptor. Master Roberto did the last two panels The Good Shepherd and the Six Prophets. The tempietto was sculpted by a Tuscan master, representing the months of the year and the apostles. The remains of St. Frediano lie underneath the main altar from the 16th century. A massive stone monolith stands left of the main altar. This was probably pilfered from the amphiteatre of Lucca. But local tradition has it that it was miraculously transported to Lucca by San Frediano and used as a predella (step of an altar) for the first altar. This article incorporates material from the Wikipedia articlesBasilica di San Frediano published under the GNU Free Documentation License. Section 14 of the Via Francigenas one of the most popular and spectacular sections of the Via Francigena. It starts in the walled city of Lucca with its amazing Renaissance wall and citadel, and finishes in the UNESCO World Heritage historic centre of Siena.